Featured below is a small sampling of the New Vending Equipment Available from Sunstate Vending Equipment Co.
Our Featured items are simply this seasons most popular sellers. Sunstate Vending Equipment Company utilizes many manufacturers and brands depending upon the environment, specific needs, décor, and other pertinent factors when suggesting the equipment that will fit your current situation. 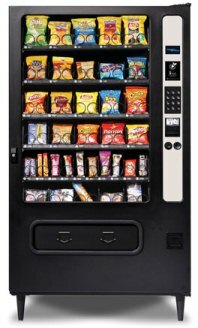 By utilizing companies such as U-Select-It and Royal Vendors, we are able to offer you a wide variety of vending machines ranging from cold drink machines, food vending machines, snack vending machines, single temperature machines, variable temperature machines or combination machines. Sunstate Vending Equipment is sure to have the reliable products that are both convenient and hassle free. Give us a call at 407-886-VEND or send us an e-mail for more information. Royal Vendors is the global leader in the design and manufacture of high-quality cold-drink vending machines. Royal maximizes profits of vendors and operators using unique features such as high-capacity space-to-sales and package flexibility. Along with their service, support and parts sales, they are the complete beverage machine manufacturer you want to choose. The NEW addition to the Mercato glass front snack vending machine line is the Mercato 7000 which offers high capacity snack volume for more flexibility and customer choices. A wonderful addition to the Mercato glass front snack vending machines line is the Mercato 5000 that offers high capacity snack volume for more flexibility and customer choices. The NEW Mercato Series glass front snack vending machine is the Mercato 4000. 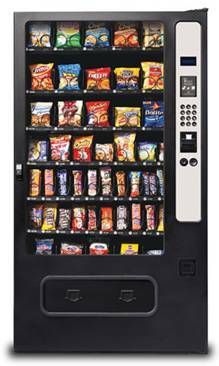 It incorporates features proven to increase the value of your snack vending business. With just a little extra space, expand your options for drink - soda vending. Summit 300 Satellite vending machine is the perfect choice. Low cost addition to your current USI snack vendor, uses same payment system! This six selection satellite soda vending machine allows you to mix bottles and cans to meet your customers needs. Versatility to serve customers beverages they want most including bottled water, sodas, sports drinks, energy drinks and juices. USI’s vending machines are built for maximum customer satisfaction, low maintenance and affordability with machines paying for themselves on every vend. USI covers all aspects of the vending machine industry, including service, energy efficiency, and healthy-environmentally friendly vending options. The numerous features make this vending machine an easy choice. This ten selection cold drink vending machine from U-Select-It vends most cold beverage containers on the market including 12 oz cans, 250 ml cans and 16, 20 and 24 oz bottles. Its bright eye catching graphic sign is easily removed for customizing to your customers brands. The tilt out product display makes selection changing a snap. Loading is simple and convenient with our innovative product stacks. • Vends 10 selections of 12 oz cans (with optional kit) and 16 oz, 20 oz and 24 oz bottles. Vends sodas, fruit juices, bottled waters, iced teas, sports drinks, energy drinks and more. This soda vending machine offers them all. Features include lighted product display, eye catching back lighted graphics, and easy to use customer purchase area make the Summit 700 a powerful tool in soda vending. Space is always an issue, especially when it comes to your vending locations. The Summit 300 soda vending machine provides the key to reducing your vending footprint and increasing selection and satisfaction. Six selections allow you to mix and match bottles and cans to meet your customer needs. The ability to vend 144 bottles, 312 cans or a combination of both bottles and cans gives you the versatility to serve your customers the beverages most desired including bottled water, sodas, sports drinks, energy drinks and juices. The Alpine Combi 3000 combination refrigerated & frozen food vending machine is our new high capacity stand alone cold and frozen food machine that fits through a 32" doorway from the leading vending machine manufacturer. No Shims - No vend mechanism adjustments necessary to change product sizes-from 12-20 oz. Give your waiting customers the option to quench their thirst with this vending machine. The 12-selection vendor holds seven-hundred-twenty-eight 12-oz. cans and/or three-hundred-twenty-two 20-oz. bottles in any combination to meet each customer's needs. The illuminated product display shows each patron which drinks are available.